Spring has sprung so once again our friends at Provelo are offering to take you on a free tour of the Brussels canal area. 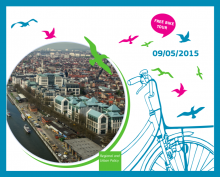 The quarter has benefited from lots of EU investment so the bike tours will take place on Schuman Day, Saturday 9 May. The three-hour tour starts at 2pm at the Berlaymont esplanade, Rond Point Schuman, and the guide will bring you back to the Berlaymont around 5pm. As always, the tour is free, Provelo’s guides speak in French, Dutch and English, and bikes are provided. More information available here, here and here. You can also check out the Facebook page and give them a follow on Twitter.